This young female calf above sports a blanket of thick algae and a bit of a little “grin”. The algae is from our warmer than normal February and this mother and calf looks to have spent a fair amount of time where the algae grows away from the springs. 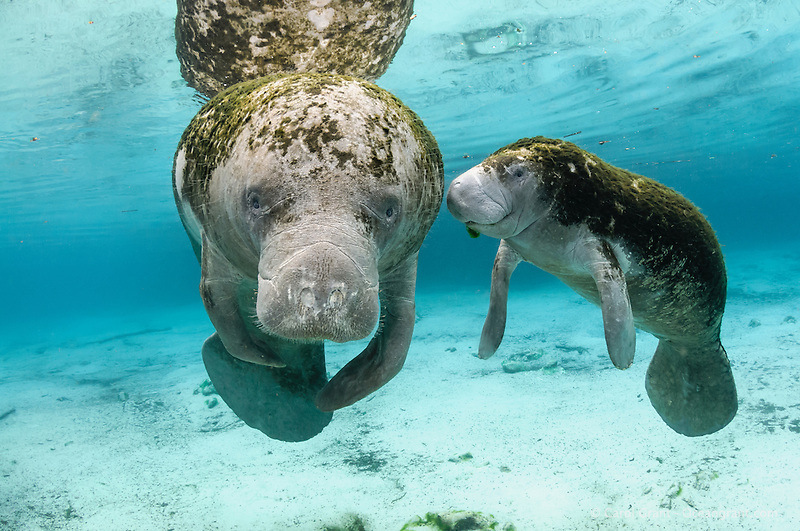 As far as her cute little “grin”, I’ve noticed manatee calves have varying expressions running the gamut between “cute” and “pouty”. 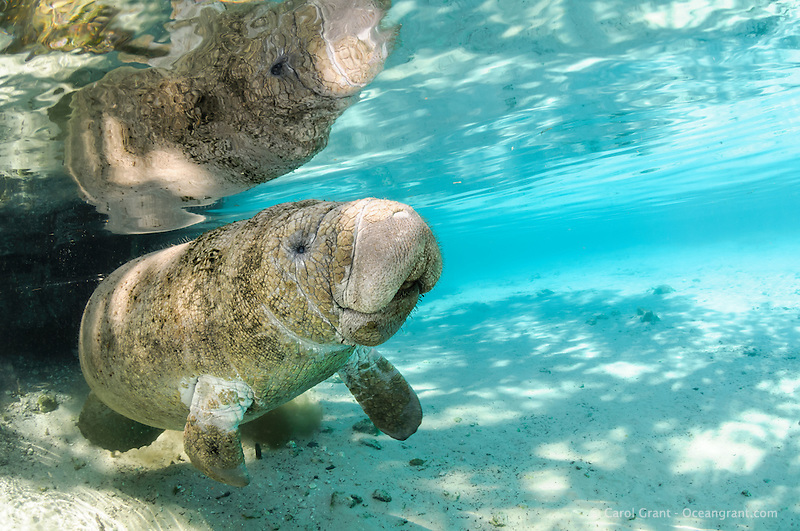 Younger manatees like this calf sometimes seem to have a cheerful expression and maybe they are still thrilled to be welcomed into this exciting world and be nurtured by mom? Blue spring water and strong sunlight are additional gifts of March. This manatee calf surfacing was taken smack dab in the middle of the day when the strong March sunlight pierces the clear freshwater. I love how the outline of the cypress tree foliage is represented in sand shadows. 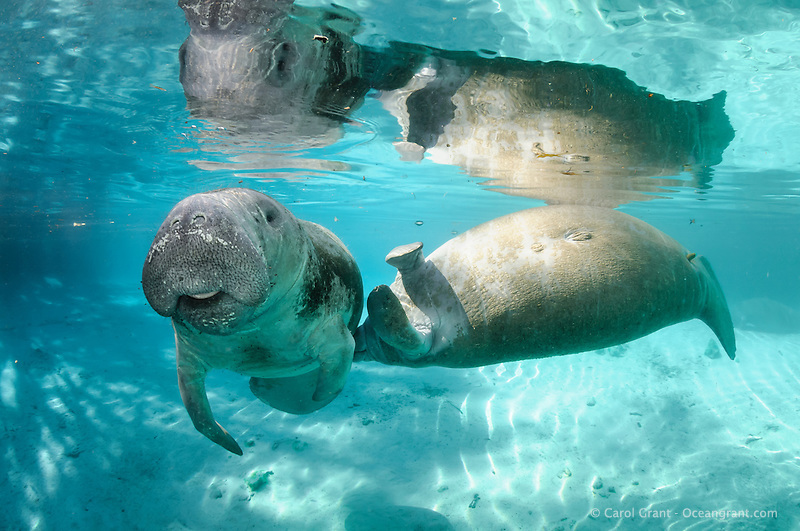 This little manatee found a special corner of the springs! March is also known for frisky socializing manatees. Cavorting groups swim in and out of the springs. Although, sometimes a frisky manatee one observes is an older male calf growing up! Dr. Bob Bonde told me they believe that when the male calf starts to get friendly with his mom she knows it is nearing time to wean him and soon he will leave the nest. The photograph above shows a male calf tickling his very patient mother. Here is the same mother and older male calf as she seems to be reassuring and caressing him. Does she know he will soon go out on his own? Does this closeness signify she cares for him and will miss him? I admit, after observing this intimate behavior I felt this mother and calf pair have deep bonding and feelings for each other and I was deeply touched. 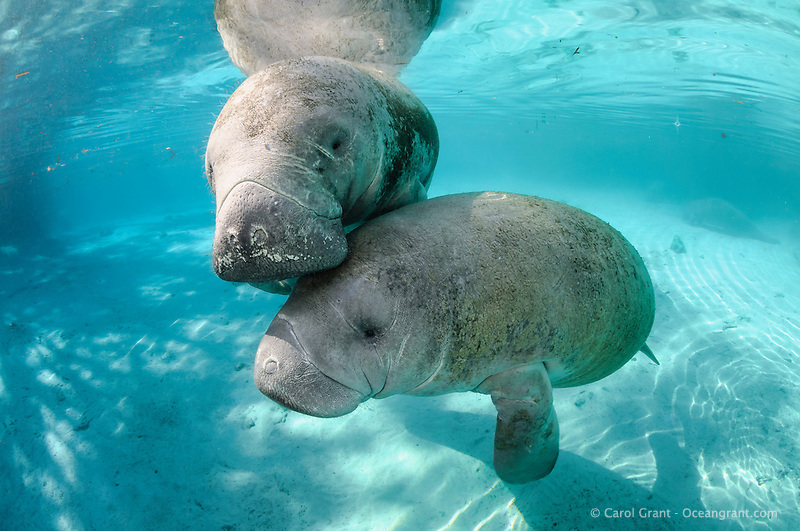 This entry was posted in Manatees and tagged Carol Grant, Citrus County, Crystal River National Wildlife Refuge, Florida manatees, freshwater, Kings Bay, mother and calf, oceangrant.com, Three Sisters Springs, underwater by Carol Grant. Bookmark the permalink.